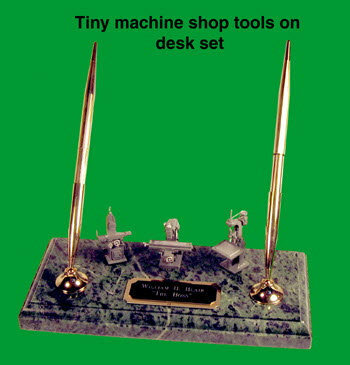 Tiny machine shop tools on desk set [DSK-320] - $129.50 : Metalcraft by Blair - military gifts and memoribilia. This is a highly detailed mini model of very tiny machine shop tools. These tool replicas are highly detailed and i do not believe you will find these any where else. This is for that machinest in your life. It has an engraved name plate so as to personalize the gift.